The EDU digital storage oscilloscope is the best choice as a substitute for a traditional analog oscilloscope. Due to creative R&D and strict cost control, the EDU series is outstanding when competing with analog oscilloscopes - even in price. 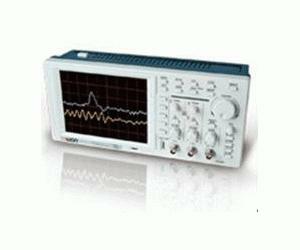 The EDU digital storage oscilloscopes display boasts a large screen STN LCD despite its compact design, and is available in bandwidths of 20MHz to 40MHz with a real sample rate of 100MS/s.The series meets the requirements of both electric manufacturing production lines, and basic mathematical education.